Ace has worked closely with many homeowner’s associations and management companies over our many years of service. 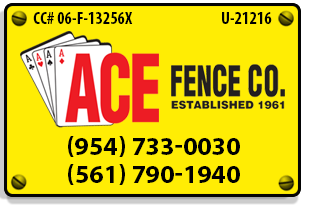 From complete perimeter fencing, community pool installations, and large decorative gates, to dumpster enclosures, tennis courts, and emergency repairs, we know your needs. We are on many approved contractor lists and meet or exceed your insurance and licensing requirements. Please see the list of some of our commercial customers and peruse the photographs showing a sampling of our work. Please also note the Testimonials from our satisfied HOA and management company customers. Then, click or call to request a proposal.